Vice President, Northern Community Investment Corp.
Cathy Conway was pursuing an engineering degree at the University of New Hampshire when she met her husband, a dairy farmer from Jefferson. His occupation simplified her decision to move to the North Country. "It was easier for me to move up here than for him to move 100 cows," said the mother of three, who is vice president of economic development at Northern Community Investment Corporation, which serves the state's northernmost region. At NCIC, the trained civil engineer writes grant proposals and develops projects that will stimulate the economy and create jobs in the most beleaguered region in the state. 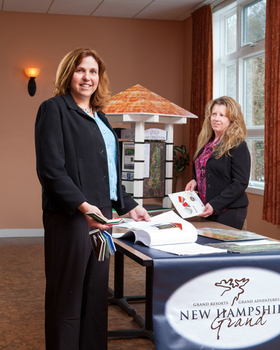 • New Hampshire Grand, a marketing campaign that's resulted in more than 400 articles published about the North Country and a 10 percent uptick in rooms and meals tax revenue in the region. Another major initiative Conway has undertaken is helping the city of Berlin tackle its housing crisis. Her efforts, which included winning several grants, led to the hiring of a city housing coordinator and elimination of much of the city's blighted housing. As Patrick MacQueen, Berlin's city manager, wrote, "It is pretty amazing how someone who works so quietly behind the scenes never seeking recognition or credit can make such an impact on a community." A.I started getting into grant writing in addition to design work and project management. I found that a lot of communities couldn't do what they needed or wanted to because of lack of funds. The engineering world wasn't as flexible as I would have liked it to have been as my family grew. As I got more involved in grant writing, I became public works director for Littleton, and from there I got into NCIC. A. One of the biggest challenges probably was early on in my career being a female in a male-dominated industry. My first job was working for the Department of Transportation as a construction inspector. I was in my 20s, fresh out of college, reviewing the work of contractors who had been in the business forever to make sure it met the specifications, so that wasn't always easy. Even today, folks in the North Country are a proud group of people. They don't always like to accept money from other resources, they want to be able to do it on their own, but it's just such tough economic conditions up here that we do need to reach outside for that assistance. A. I had some bosses that I learned a lot from. In my engineering days, my boss Ed said that the simplest solution that works is the best, so why make things more complicated than they need to be? A. When I first started, I really didn't do a very good job of it, because work always came first, unfortunately. But I think that having a supportive network of family and friends helps, and also my current boss has said more than once, if you don't have a balance between family, fun and work, it doesn't work. A. Do something you love or you enjoy or you're passionate about, because you will be successful. Stay focused on the task at hand, regardless of what's going on around you. Be flexible because you have to react to what happens and what changes, and have a sense of humor about it.